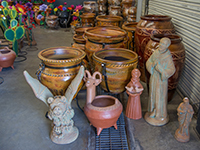 Visit Quality Pottery on Nogales Hwy. When you have a great selection of pottery, it not only enhances the beauty of your home, but also makes a big style statement. Whether you're looking to add colorful designs to your home or need a simple flower pot, Pottery Fiesta is your resource for great choice and quality! Pricing on the Entire Inventory. 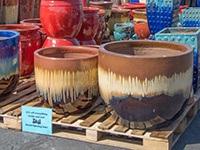 You're sure to find the perfect decorative addition to your outdoor space at locally owned and operated Pottery Fiesta. Get gorgeous, decor enhancing pieces at excellent prices while supporting small business! Have a look at some of our inventory. At Pottery Fiesta we update our inventory quite frequently so we may not have an exact match to an image you find in our gallery and you may find something even more sensational in our next shipment. They have pottery and wall hangings from Mexico. We thought it was clean, well displayed and the two young men working there were knowledgable and pleasant. They prices seemed reasonable. What's not to like. We bought a nice wall hanging for the patio. Totally agree with great service and the merchandise. Both the guys are awesome, knowledgeable, and extremely helpful. On a side note they are definitely very generous to SB often donating high end products to our annual silent auction in support of Adopt-a-Child. Next time you shop there, be sure to tell them you're a Saddlebrooke resident and ask what kind of discount they can give you. Amazing quality and customer service can't be beat! Thanks for a great selection and super prices. We love all our new pots! And a BIG thank you for your dependable and polite delivery service! Thank you Pottery Fiesta!!! Loving these new pots...they look amazing!!! Now excited to plant something in them!!! You guys Rock!!! Great selection, great prices, great place. The latest buzz in Catalina is a brand new small business venture—Pottery Fiesta LLC—undertaken by SaddleBrooke residents, Brad and Julia Huff. Yes we deliver to Catalina, SaddleBrooke, Oro Valley, Oracle and Dove Mountain. There is a nominal charge for delivery based on your minimum purchase. 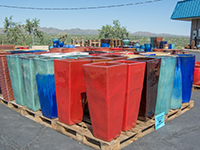 Red clay pots will last an average of 2 years in AZ sun, while Hi-Fired Pots can last up to 10 years. Just 6.1% since we are located outside the city limits so there is no city tax. Put high-fire glazed pottery on your list of must-haves from Pottery Fiesta! These long-lasting products originated in Asia and you'll find nothing but creations from Vietnam and China in our collection. If you have questions about our products or services please don't hesitate to stop by our location or give us a call.